Proper surface preparation is the key to any successful paint application, especially outdoors. Using 1-Shot Primers is the first step in achieving optimal results. 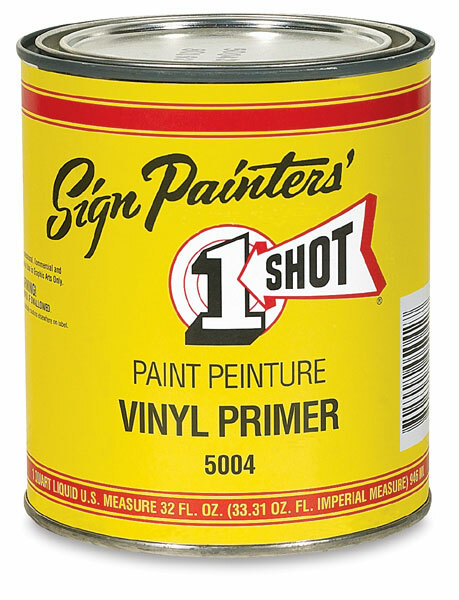 These professional-quality primers are formulated to provide a stable, durable basecoat on a wide range of surfaces commonly used by sign painters. They offer ultimate adhesion when used in combination with 1-Shot Lettering Enamels, along with the convenience of soap-and-water cleanup. Universal White Primer — This fast-drying, waterborne modified acrylic primer is suitable for many surfaces, including wood, metal, HDU, and properly prepared brick, block, and concrete. It has excellent adhesion qualities and is easy to sand. This high-performance primer is ready for over-painting within three hours. High Build White Primer — This is a high-viscosity waterborne primer with excellent filling and building characteristics. It's ideally suited for HDU (high density urethane), most woods, and foams. 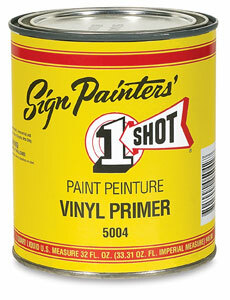 High Build Primer provides great coverage and can easily be sanded smooth. Vinyl Primer — This waterbased primer is specifically designed for vinyl surfaces and other rigid synthetic substrates that aren't receptive to enamel paint, including ABS plastics, corrugated styrene, expanded PVC, and most PVC vinyl films. It creates a barrier against plasticizer migration. Milky when applied, it dries clear and is generally ready for over-painting in 30–40 minutes.